Human immunodeficiency virus (HIV) infection is currently incurable, due to the persistence of latently infected cells. The ‘shock and kill’ approach to a cure proposes to eliminate this reservoir via transcriptional activation of latent proviruses, enabling direct or indirect killing of infected cells. Currently available latency-reversing agents (LRAs) have however proven ineffective. To understand why, we used a novel HIV reporter strain in primary CD4+ T cells and determined which latently infected cells are reactivatable by current candidate LRAs. Remarkably, none of these agents reactivated more than 5% of cells carrying a latent provirus. Sequencing analysis of reactivatable vs. non-reactivatable populations revealed that the integration sites were distinguishable in terms of chromatin functional states. Our findings challenge the feasibility of ‘shock and kill’, and suggest the need to explore other strategies to control the latent HIV reservoir. Antiretroviral therapy (ART) has transformed HIV infection from a uniformly deadly disease into a chronic lifelong condition, saving millions of lives. However, ART interruption leads to rapid viral rebound within weeks due to the persistence of proviral latency in rare, long-lived resting CD4+ T cells and possibly in tissue macrophages (Honeycutt et al., 2017). HIV latency is defined as the presence of a transcriptionally silent but replication-competent proviral genome. Latency allows infected cells to evade both immune clearance mechanisms and currently available ART, which is based solely on the elimination of actively replicating virus. An extensively investigated approach to purging latent HIV is the ‘shock and kill’ strategy, which consists of forcing the reactivation of latent proviruses (‘shock’ phase) with the use of latency reversing agents (LRAs), while maintaining ART to prevent de novo infections. Subsequently, reactivation of HIV expression would expose such cells (shocked cells) to killing by viral cytopathic effects and immune clearance (‘kill’ phase). A variety of LRAs have been explored in vitro and ex vivo, with only a few candidates being advanced to testing in pilot human clinical trials. Use of histone deacetylase inhibitors (HDACi: vorinostat, panobinostat, romidepsin, and disulfiram) in clinical studies has shown increases in cell-associated HIV RNA production and/or plasma viremia after in vivo administration (Archin et al., 2012a; Elliott et al., 2015; Elliott et al., 2014; Rasmussen et al., 2014; Søgaard et al., 2015). However, none of these interventions alone has succeeded in significantly reducing the size of the latent HIV reservoir (Rasmussen and Lewin, 2016). Several obstacles can explain the failure of LRAs, as reviewed in (Margolis et al., 2016; Rasmussen et al., 2016). However, the biggest challenge to date is our inability to accurately quantify the size of the reservoir. The absolute quantification (number of cells) of the latent reservoir in vivo (and ex vivo) has thus far been technically impossible. The most sensitive, quickest, and easiest assays to measure the prevalence of HIV-infected cells are PCR-based, quantifying total or integrated HIV DNA or RNA transcripts. However these assays substantially overestimate the number of latently infected cells, due to the predominance of defective HIV DNA genomes in vivo (Bruner et al., 2016; Ho et al., 2013). The best currently available assay to measure the latent reservoir is the relatively cumbersome viral outgrowth assay (VOA), which is based on quantification of the number of resting CD4+ T cells that produce infectious virus after a single round of maximum in vitro T-cell activation. After several weeks of culture, viral outgrowth is assessed by an ELISA assay for HIV-1 p24 antigen or a PCR assay for HIV-1 RNA in the culture supernatant. Importantly, the number of latently infected cells detected in the VOA is 300-fold lower than the number of resting CD4+ T cells that harbor proviruses detectable by PCR. This reliance on a single round of T-cell activation likely incorrectly estimates the viral reservoir for two reasons. First, the discovery of intact non-induced proviruses indicates that the size of the latent reservoir may be much greater than previously thought: the authors estimate that the number may be at least 60 fold higher than estimates based on VOA (Ho et al., 2013; Sanyal et al., 2017). This work and that of others (Chen et al., 2017) highlight the heterogeneous nature of HIV latency and suggest that HIV reactivation is a stochastic process that only reactivates a small fraction of latent viruses at any given time (Dar et al., 2012; Ho et al., 2013; Singh et al., 2010; Weinberger et al., 2005). Second, the ability of defective proviruses to be transcribed and translated in vivo (Pollack et al., 2017): this study shows that, although defective proviruses cannot produce infectious particles, they express viral RNA and proteins, which can be detectable by any p24 antigen or PCR assays used for the reservoir-size quantification. Thus, current assays underestimate the actual number of latently infected cells, both in vivo and ex vivo, and the real size of HIV reservoir is still to be determined. Therefore, it has been difficult to judge the potential of LRAs in in vitro (latency primary models), ex-vivo (patients’ samples) and in vivo (clinical trial) experiments. HIV latency is a complex, multi-factorial process (reviewed in [Dahabieh et al., 2015]). Its establishment and maintenance depend on: (a) viral factors, such as integrase that specifically interacts with cellular proteins, including LEDGF, (b) trans-acting factors (e.g., transcription factors) and their regulation by the activation state of T cells and the environmental cues that these cells receive, and (c) cis-acting mechanisms, such as the local chromatin environment at the site of integration of the virus into the genome. Recent evidence has also highlighted the association of specific HIV-1 integration sites with clonal expansion of latently infected cells (reviewed in [Maldarelli, 2016]). The role of the site of HIV integration into the cellular genome in the establishment and maintenance of HIV latency has remained controversial. While early studies found that the HIV integration site does affect both the entry into latency (Chen et al., 2017; Jordan et al., 2003; Jordan et al., 2001), and the viral response to LRAs (Chen et al., 2017), other studies have failed to find a significant role of integration sites in regulating the fate of HIV infection (Dahabieh et al., 2014; Sherrill-Mix et al., 2013). In this study, we have used a new dual color reporter virus, HIVGKO, to investigate the reactivation potential of various LRAs in pure latent population. We find that latency is heterogeneous and that only a small fraction (<5%) of the latently infected cells is reactivated by LRAs. We also show that both genomic localization and chromatin context of the integration site affect the fate of HIV infection and the reversal of viral latency. Our laboratory reported the development of a dual-labeled virus (DuoFluoI) in which eGFP is under the control of the HIV-1 promoter in the 5′ LTR and mCherry is under the control of the cellular elongation factor one alpha promoter (EF1α) (Calvanese et al., 2013). 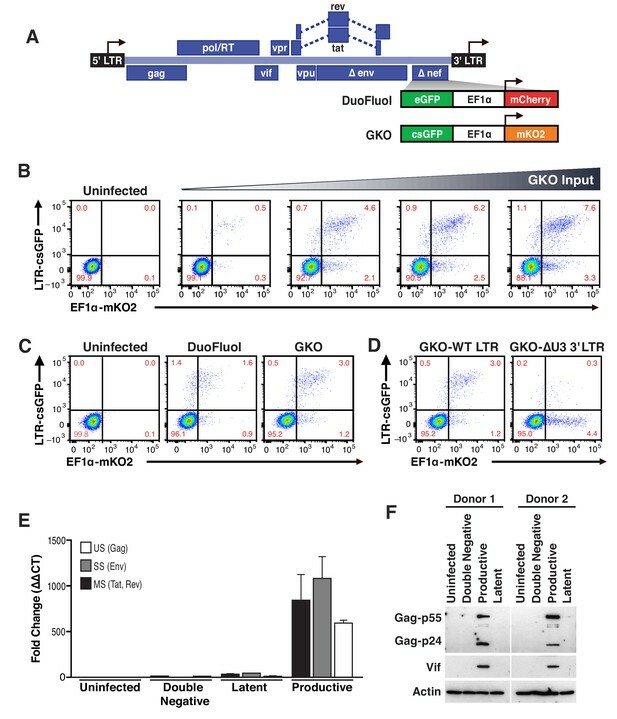 However, we noted that the model was limited by a modest number of latently infected cells (<1%) generated regardless of viral input (Figure 1—figure supplement 1A–1C), as well as a high proportion of productively infected cells in which the constitutive promoter EF1α was not active (GFP+, mCherry-). To address these issues, which we suspected were due to recombination between the 20–30 bp regions of homology at the N- and C-termini of the adjacent fluorescent proteins (eGFP and mCherry) (Salamango et al., 2013), we generated a new version of dual-labeled virus (HIVGKO), containing a codon-switched eGFP (csGFP) and a distinct, unrelated fluorescent protein mKO2 under the control of EF1α (Figure 1A). First, titration of HIVGKO input revealed that productively and latently infected cells increased proportionately as the input virus increased (Figure 1B and Figure 1—figure supplement 1), unlike the original DuoFluoI (Figure 1—figure supplement 1). Second, comparison of primary CD4+ T cells infected with HIVGKO or the original DuoFluoI revealed an increase in double-positive (csGFP+ mKO2+) infected cells in HIVGKO infected cells (Figure 1C). A small proportion of csGFP+ mKO2- cells were still visible in HIVGKO infected cells. We generated a HIVGKO virus lacking the U3 promoter region of the 3′LTR (ΔU3-GKO), resulting in an integrated virus devoid of the 5’ HIV U3 region. This was associated with a suppression of HIV transcription and an inversion of the latency ratio (ratios latent/productive = 0.34 for HIVGKO-WT-LTR and 8.8 for HIVGKO-ΔU3-3’LTR - Figure 1D). Finally, to further characterize the constituent populations of infected cells, double-negative cells, latently and productively infected cells were sorted using FACS and analyzed for viral mRNA and protein content. (Figures 1E and F, Figure 1—source data 1). As expected, productively infected cells (csGFP+) expressed higher amounts of viral mRNA and viral proteins, but latently infected cells (csGFP- mKO2+) had very small amounts of viral mRNA and no detectable viral proteins. Second generation of dual-fluorescence HIV-1 reporter, HIVGKO to quantify stable latency. (A) Schematic representation of first (top: HIVDuoFluoI) and second generation (bottom: HIVGKO) of dual-labeled HIV-1 reporters. (B) Representative experiment of HIVGKO virus titration in activated primary CD4+ T cells (4 days post-infection). Primary CD4+ T cells were activated with αCD3/CD28 beads + 20 U/mL IL-2 for 3 days before infection with different amounts of HIVGKO (input, ng/p24) and analyzed by flow cytometry 4 days post-infection. (C) Comparison of HIVDuoFluoI and HIVGKO infection profiles by flow cytometry in activated primary CD4+ T-cells (4 days post-infection). Cells were treated as in (B). (D) Comparison of GKO-WT-LTR and GKO-ΔU3 3'LTR infection profiles by flow cytometry in cells treated as in (B). (E, F) Primary CD4+ T cells were treated as in (B). At 4 days post-infection, double-negative, productively infected, and latently infected cells were sorted out, and (E) the total RNA isolated from each population was subjected to Taqman RT-qPCR analysis (Source Data - Figure 1). Unspliced (US), singly spliced (SS), and multiply spliced (MS) HIV-1 mRNAs were quantified relative to cellular GAPDH. (F) Western blot analysis of each population. Based on all these findings, the second-generation of dual-fluorescence reporter, HIVGKO, is able to more accurately quantify latent infections in primary CD4+ T cells than HIVDuoFluoI, and thus allows for the identification and purification of a larger number of latently infected cells. Using flow cytometry, we can determine infection and HIV productivity of individual cells and simultaneously control for cell viability. Next, we evaluated the reactivation of latent HIVGKO in primary CD4+ T cells by LRAs, and compared it with the ability of the same LRAs to reverse latency in CD4+ T cells isolated from HIV-infected individuals. We tested the following LRAs: (a) the histone deacetylase inhibitor (HDACi) panobinostat (Rasmussen et al., 2013), (b) the bromodomain-containing protein 4 (BRD4) inhibitor JQ1, which acts through positive transcription elongation factor (P-TEFb) (Banerjee et al., 2012; Boehm et al., 2013; Filippakopoulos et al., 2010; Li et al., 2013; Zhu et al., 2012), and (c) the PKC activator, bryostatin-1 (del Real et al., 2004; Mehla et al., 2010). Viral reactivation mediated by these LRAs was compared to treatment of CD4+ T cells with αCD3/CD28 (Spina et al., 2013). Several studies have shown synergetic effects when combining different LRAs (Darcis et al., 2015; Jiang et al., 2015; Laird et al., 2015; Martínez-Bonet et al., 2015), therefore we also tested bryostatin-1 in combination with either panobinostat or JQ1. Drugs were used at concentrations previously shown to be effective at reversing latency in other model systems (Archin et al., 2012a; Bullen et al., 2014; Laird et al., 2015; Spina et al., 2013). To measure reactivation by LRAs in patient samples, we treated 5 million purified resting CD4+ T cells from four HIV infected individuals on suppressive ART (participant characteristics in Table 1) with single LRAs, combinations thereof, or vehicle alone for 24 hr. LRAs efficacy was assessed using a PCR-based assay, by measuring levels of intracellular HIV-1 RNA using primers and a probe that detect the 3′ sequence common to all correctly terminated HIV-1 mRNAs (Bullen et al., 2014). Of the LRAs tested individually, none exhibited a statistically significant effect (n=4 - Figure 2A, Figure 2—source data 1). Importantly, T-cell activation positive control, αCD3/CD28 (24.4-fold, Figure 2A), showed expected fold induction value (10 to 100-fold increases of HIV RNA in PBMCs [Bullen et al., 2014; Darcis et al., 2015; Laird et al., 2015]). Combinations of the PKC agonist bryostatin-1 with JQ1 or with panobinostat (fold-increases of 126.2- and 320.8-fold, respectively, Figure 2A), were highly more effective than bryostatin-1, JQ1 or panobinostat alone (fold-increases of 6.8, 1.7- and 2.9-fold, respectively, Figure 3A), and even greater than T-cell activation with αCD3/CD28. This observation is consistent with previous reports (Darcis et al., 2015; Jiang et al., 2015; Laird et al., 2015; Martínez-Bonet et al., 2015). LRAs efficacy in patient samples is predicted by activity in HIVGKO latently infected cells. (A) Intracellular HIV-1 mRNA levels in rCD4s, obtained from infected individuals and treated ex vivo with a single LRA or a combination of two LRAs for 24 hr in presence of raltegravir, presented as fold induction relative to DMSO control. (n = 4, mean +SEM) (Figure 2—source data 1). (B) Intracellular HIV-1 mRNA levels in HIVGKO latently infected CD4+ T-cells, and treated with a single LRA or a combination of two LRAs for 6 hr in presence of raltegravir, presented as fold induction relative to DMSO control. (n = 3 (different donors), mean +SEM, paired t-test) (Figure 2—source data 1). (C) Correlation between intracellular HIV-1 mRNA levels quantified in either 6 hr stimulated HIVGKO latently infected CD4+ T-cells from different donors, or 24 hr stimulated rCD4s from HIV infected patients, with a single LRA or a combination of two LRAs in presence of raltegravir. Few HIVGKO latently infected primary CD4+ T cells are reactivated. (A) Schematic of experimental procedure with primary CD4+ T cells. Briefly, CD4+ T cells were purified from blood of healthy donors and activated for 72 hr with αCD3/CD28 beads and 100 U/ml IL-2 before infection with HIVGKO. Five days post-infection, latently infected cells (csGFP- mKO2+) cells were sorted, put back in culture overnight and stimulated with different LRAs in presence of raltegravir for 24 hr before performing FACS analysis. (B) Percentage of GFP+ cells is shown after stimulation of latently infected CD4+ T-cells with LRAs (n = 4 (different donors), mean +SEM, paired t-test) (Figure 3—source data 1). (C) Histogram plot of percent live cells for each drug treatment (n = 3 (different donors), mean + SEM, paired t-test) (Figure 3—source data 1). p-value: *p<0.05, **p<0.01 relative to DMSO. ABC, abacavir; DRV, darunavir; FTC, emtricitabine; RPV, rilpivirine; RTV, ritonavir; TCV, tivicay; TDF, tenofovir; 3TC, lamivudine; VL, viral load. The same LRAs and combinations were next tested after infection of human CD4+T cells in vitro with HIVGKO. Measurement of intracellular HIV-1 mRNA in HIVGKO latently infected cells showed an expected fold induction of latency in response to αCD3/CD28 (11.3-fold, Figure 2B, Figure 2—source data 1). Second, JQ1, panobinostat, and bryostatin-1 alone all caused limited reactivation of latent HIV (fold-increases of 1.1-, 5.6- and 6.2-fold, respectively, Figure 2B), as observed in patients’ samples. 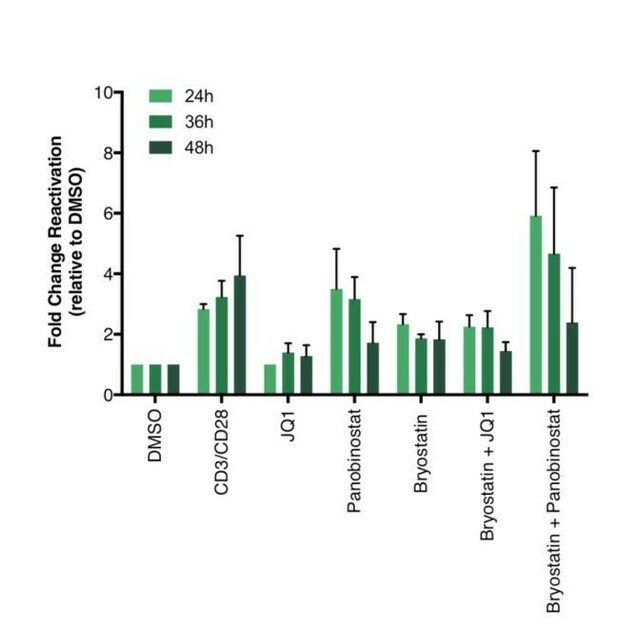 Finally, we observed low synergy when combining bryostatin and JQ1 (8-fold increase), but high synergy between bryostatin and panobinostat (67.3-fold increase). These data together demonstrate that HIVGKO closely mimics in vitro what is observed in ex vivo patients’ samples (correlation rate r2 = 0.88, p=0.0056 - Figure 2C), and validate the robustness and reliability of the dual-florescence HIV reporter as a model to study HIV-1 latency. Current assays have relied on PCR-based assays to measure HIV RNA, and to evaluate the efficacy of different LRAs (Figure 2A). The use of dual-fluorescent HIV reporters, however, provides a tool to quantify directly the fraction of cells that become reactivated. To quantify the absolute number of latently infected cells reactivated following LRA treatment, primary CD4+ T cells were infected with HIVGKO, and cultured for 5 days (in the presence of IL-2) before sorting the pure latent population (GFP-, mKO2+). Cells were allowed to rest overnight and were treated for 24 hr with the various LRAs (same drug concentrations as in Figure 2) (Figure 3A, Figure 3—source data 1). Culture of DMSO-treated latently infected primary CD4+ T cells produced little spontaneous reactivation (average of four experiments: 1.4% of GFP+ cells). Unexpectedly, we found that none of the individual LRAs or their combinations reactivated more than 5.5% of the latently infected cells: JQ1 (1.7%) panobinostat (3.7%), bryostatin-1 (3%) αCD3/CD28 (4.5%), bryostatin-1 and JQ1 (3.3%.). bryostatin-1 and panobinostat (5.5%) (Figure 3B). These data highlight two important facts: a) cell-associated HIV RNA quantification does not reflect the absolute number of cells undergoing viral reactivation, and b) induced cell-associated HIV RNA, in response to all reversing agents, comes from a small fraction of reactivated latent cells. This was particularly surprising with αCD3/CD28 stimulation, as a currently accepted model for HIV latency is that the state of T cell activation dictates the transcriptional state of the provirus. Treatment of latently infected primary CD4+ T cells with αCD3/CD28 stimulated HIV production in less than 5% of the cells, while the other 95% remained latent, even though after 24 hr of treatment nearly all of the cells had upregulated the early T cell activation marker CD69 (Figure 4—figure supplement 1). To further rule out the possibility that non-reactivated latently infected cells (NRLIC) simply represented a lack of efficient response to T-cell activation signals, we analyzed T-cell activation markers within the different populations (i.e., within uninfected, non reactivated (NRLIC) and reactivated latently infected cells (RLIC); Figure 4, Figure 4—source data 1). Briefly, 72h-stimulated CD4+ T cells were infected with HIVGKO, and 4 days later, GFP- cells were sorted, and allowed to rest overnight before restimulation with αCD3/CD28. After another 24 hr, cells were stained for the early, intermediate, and late markers of T cell activation CD69, CD25 and HLA-DR respectively. 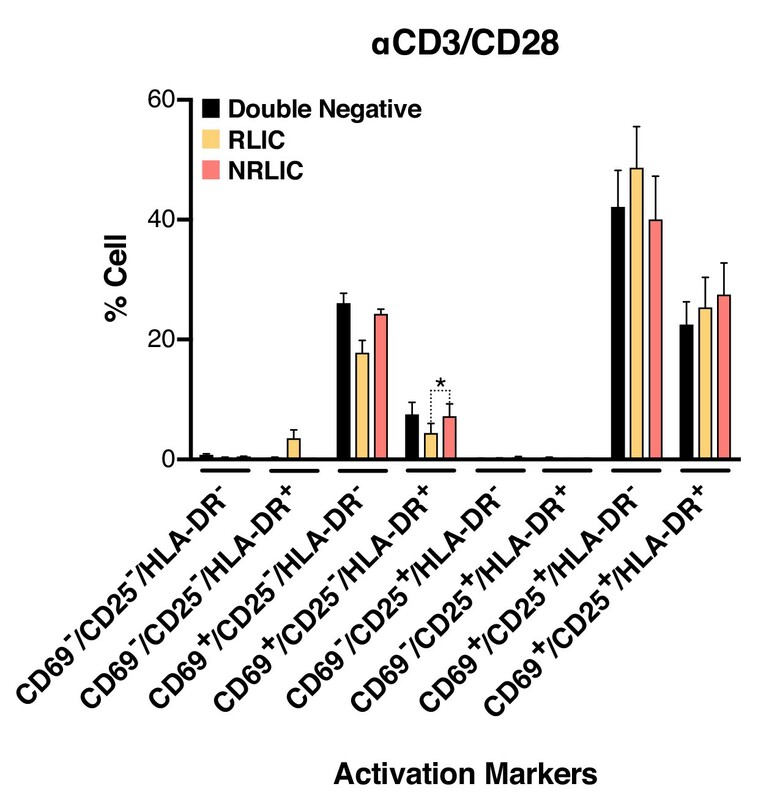 The three different populations, double negative, RLIC and NRLIC, had similar profiles of activated T-cell subsets, as shown in Figure 4, and were mainly composed of strongly activated cells (CD69+/CD25+/HLA-DR+/-). We only observed a statistically significant increase of NRLIC compared with RLIC in the CD69+/CD25-/HLA-DR+ population, however this small increase in a relatively minor population is insufficient to explain the low reactivation rate of latently infected cells. Overall, comparison of both reactivated and non reactivated latent populations showed little difference in their activation state. Low-level latency reactivation is not explained by low cellular responses to activation signals. T-cell activation patterns between double negative, reactivated (RLIC) and non-reactivated (NRLIC) latently infected cells. Briefly, CD4+ T-cells were purified from blood of four healthy donors and activated for 72 hr with αCD3/CD28 beads and 20 U/ml IL-2 before infection with HIVGKO. At 4 days post-infection, csGFP- were sorted, cultured overnight and stimulated with αCD3/CD28 in presence of raltegravir. At 24 hr post-treatment, cells were stained for CD25, CD69, and HLA-DR activation markers before performing FACS analysis. (n = 4, mean +SEM, paired t-test; *p<0.05; **p<0.01) (Figure 4—source data 1). The role of the site of HIV integration into the genome in latency remains a subject of debate (Chen et al., 2017; Dahabieh et al., 2014; Jordan et al., 2003; Jordan et al., 2001; Sherrill-Mix et al., 2013). To identify possible differences in integration sites between reactivated and non-reactivated HIV genomes, primary CD4+ T-cells were infected with HIVGKO. At 5 days post-infection, productively infected cells (GFP+, PIC) were sorted and frozen. The GFP negative population (consisting of a mixture of latent and uninfected) was isolated and treated with αCD3/CD28. 48 hr post-induction, both non reactivated (NRLIC) and reactivated (RLIC) populations were isolated. Nine libraries (three donors, three samples/donor: PIC, RLIC, NRLIC) were constructed from genomic DNA as described (Cohn et al., 2015) and analyzed by high-throughput sequencing to locate HIV proviruses within the human genome. A total of 1803 virus integration sites were determined: 960 integrations in PIC, 681 in NRLIC, and 162 in RLIC (Integration Sites Source data). To determine whether integration within genes differentially expressed during T-cell activation predicted infection reactivation fate, we compared our HIV integration dataset with a published dataset for gene expression in resting and activated (48 hr - αCD3/CD28) CD4+ T cells from healthy individuals (Ye et al., 2014). The analysis revealed that most of the αCD3/CD28-induced latent proviruses were not integrated in genes responsive to T-cell activation signals (Figure 5A and B, Figure 5—source data 1). 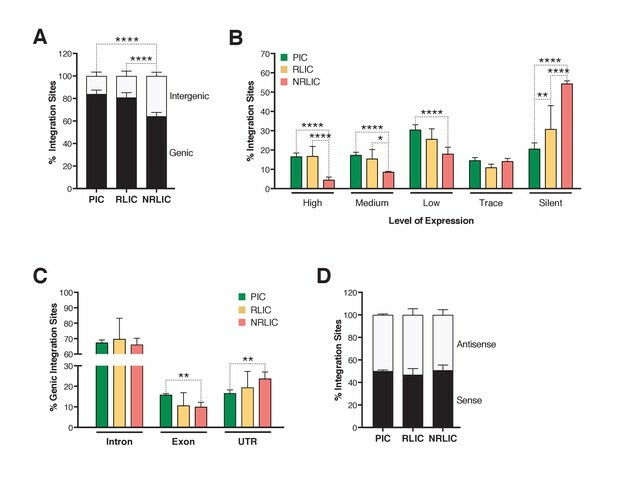 Interestingly, PIC and RLIC integration events were associated with genes whose basal expression was significantly higher than genes targeted in NRLIC, both in activated and resting T cells (Figure 5C, Figure 5—source data 2). Relative expression of HIV-1 integration targeted genes for each population, before or after TCR activation. (A) Scatter chart showing primary CD4+ T-cell gene expression changes after 48 hr of stimulation with αCD3/CD28 beads. Integration sites displayed outside of the two solid gray lines were targeted genes whose expression is at least ± twofold differentially expressed after 48 hr stimulation. Plot points size can be different, the bigger the plot point is, the more integration events happened within the same gene. (B) Fraction of integration sites from the different populations PIC, RLIC or NRLIC, integrated within genes whose expression is at least ± twofold differentially expressed after 48 hr of αCD3/CD28 stimulation (**p<0.01; ***p<0.001; two-proportion z test) (Figure 5—source data 1). (C) Relative expression of genes targeted by HIV-1 integration in PIC, RLIC or NRLIC before TCR stimulation and after αCD3/CD28 stimulation (n = 3, mean +SEM, paired t-test). ***p<0.001; ****p<0.0001. (Figure 5—source data 2). Next, we investigated whether different genomic regions were associated with productive, inducible or non-inducible latent HIV-1 infections. In agreement with previous studies (Cohn et al., 2015; Dahabieh et al., 2014; Maldarelli et al., 2014; Wagner et al., 2014), the majority of integration sites were found within genes in each population (Figure 6A, Figure 6—source data 1), although the proportion of genic integrations in NRLIC was significantly lower than in PIC and RLIC samples. Moreover, integration events in the PIC and RLIC populations were more frequent in transcribed regions (64% and 58%, respectively, [sum of low + medium + high transcribed regions] (Figure 6B), Figure 6—source data 1), while these regions were significantly less represented in the NRLIC (31%) (Figure 6B). As expected since introns represent a much larger proportion of genes, genic integration events were more frequent in the introns for each population (>65%, Figure 6C, Figure 6—source data 1). Finally, viral orientation of proviruses with respect to the transcriptional unit did not correlate with the fate of HIV infection (latent vs productive) or the reactivation or absence thereof of HIV latency (Figure 6D, Figure 6—source data 1). (A) Proportion of mapped insertions that are in genic or intergenic regions. (Figure 6—source data 1). (B) Proportion of integration sites in transcribed regions with high (top 1/8), medium (top 1/4–1/8), low expression (top 1/2–1/4), trace (bottom 1/2) or silent (0) expression. (Figure 6—source data 1). (C) Proportion of unique genic integration sites located in introns, exons, UTR or promoters. (Figure 6—source data 1). (D) Transcriptional orientation of integrated HIV-1 relative to host gene. (Figure 6—source data 1). p-value: *p<0.05; **p<0.01; ***p<0.001; ****p<0.0001 using two-proportion z test. Chromatin marks, such as histone post-translational modifications (e.g., methylation and acetylation) and DNA methylation, are involved in establishing and maintaining HIV-1 latency (De Crignis and Mahmoudi, 2017). We examined 500 bp regions centered on all integration sites in each population for several chromatin marks by comparing our data with several histone modifications and DNaseI ENCODE datasets. We first looked at distinct and predictive chromatin signatures, such as H3K4me1 (active enhancers), H3K36m3 (active transcribed regions), H3K9m3 and H3K27m3 (repressive marks of transcription) (reviewed in [Kumar et al., 2015; Shlyueva et al., 2014]). All three populations exhibited distinct profiles, although productive and inducible latent infections profiles appeared most similar (Figure 7A, Figure 7—source data 1). The analysis showed that PIC integration events were associated with active chromatin (i.e., transcribed genes - H3K36me3 or enhancers - H3K4me1), while NRLIC integration events appeared biased toward heterochromatin (H3K27me3 and H3K9me3) and non-accessible regions (DNase hyposensitivity). Epigenetics marks and nuclear localization of HIV-1 integration sites. (A) 500 bp centered on HIV-1 integration sites for each population were analyzed for the presence of H3K4me1 (active enhancers), H3K36m3 (active transcribed regions), H3K9m3 and H3K27m3 (repressive marks of transcription), and DNA accessibility (DNAseI). (Figure 7—source data 1). (B) Nuclear localization of HIV-1 integration sites. Quantification was based on inside a LAD (=1) or outside (=0), which means the Y axis represents the fraction of integrations within a LAD. (Figure 7—source data 1). (n = 3–4 ENCODE donors, mean +SEM, paired t-test). *p<0.05; **p<0.01; ***p<0.001). Marini et al. recently reported that HIV-1 mainly integrates at the nuclear periphery (Marini et al., 2015). We therefore examined the topological distribution of integration sites from each population inside the nucleus by comparing our integration site data with a previously published dataset of lamin-associated domains (LADs) (Guelen et al., 2008). LADs consist of H3K9me2 heterochromatin and are present at the nuclear periphery. This analysis showed that latent integration sites from both RLIC and NRLIC were in LADs to a significantly higher degree (32% and 30.4%) than productive integrations (23.6%) (p<0.05, Figure 7B, Figure 7—source data 1). Overall, these data show similar features between productively infected cells and inducible latently infected cells, while non-reactivated latently infected cells appear distinct from the other populations. These findings support a prominent role for the site of integration and the chromatin context for the fate of the infection itself, as well as for latency reversal. Dual-color HIV-1 reporters are unique and powerful tools (Calvanese et al., 2013; Dahabieh et al., 2013), that allow for the identification and the isolation of latently infected cells from productively infected cells and uninfected cells. Latency is established very early in the course of HIV-1 infection (Archin et al., 2012b; Chun et al., 1998; Whitney et al., 2014) and, until the advent of dual-reporter constructs, no primary HIV-1 latency models have allowed the study of latency heterogeneity at this very early stage. Importantly, the comparison of data obtained from distinct primary HIV-1 latency models is complicated as some models are better suited to detect latency establishment (e.g., dual-reporters), while others are biased towards latency maintenance (e.g., Bcl2-transduced CD4+ T cells). The use of env-defective viruses limits HIV replication to a single-round and, thereby limits the appearance of defective viruses (Bruner et al., 2016). In this study, we describe and validate an improved version of HIVDuoFluoI, previously developed in our laboratory (Calvanese et al., 2013), which accurately allows for: (a) the quantification of latently infected cells, (b) the purification of latently infected cells, and (c) the evaluation of the ‘shock and kill’ strategy. Our data highlight two important facts: (a) cell-associated HIV RNA quantification does not reflect the number of cells undergoing viral reactivation, and (b) a small portion of the cells carrying latent proviruses (<5%) is reactivated, although LRAs target the whole latent population. Hence, even if cells harboring reactivated virus die, this small reduction would likely remain undetectable when quantifying the latent reservoir in vivo. Our data are in agreement with previous reports, which show that levels of cellular HIV RNA and virion production are not correlated, and that the absolute number of cells being reactivated by αCD3/CD28 is indeed limited to a small fraction of latently infected cells (Cillo et al., 2014; Sanyal et al., 2017; Yucha et al., 2017). Using our dual-fluorescence reporter, we confirm these findings, and extend these observations to LRAs combinations. However, although LRAs combinations show synergy when measuring cell-associated HIV RNA, we do not find such synergy at the level of individual cells, but rather only partial additive effect. Our work, as well as that of others (Cillo et al., 2014; Sanyal et al., 2017; Yucha et al., 2017), demonstrate the importance of single cell analysis when it comes to the evaluation of potential LRAs. Indeed, it is necessary to determine wheter potential increases in HIV RNA after stimulation in a bulk population result from a small number of highly productive cells, or from a larger but less productive population, as these two mechanisms likely have very different impacts on the latent reservoir. Our data further highlight the heterogeneous nature of the latent reservoir (Chen et al., 2017; Ho et al., 2013). We currently have a limited understanding of why some latently infected cells are capable of being induced while others are not. It is possible that different chromatin environments impose different degrees of transcriptional repression on the integrated HIV genome, with the non reactivatable latent HIV corresponding to the most repressive environment. (Chen et al., 2017). Since HIVGKO allows for the isolation of productively infected cells and reactivated latent cells from those that do not reactivate, it provides a unique opportunity to explore the impact of HIV integration on the fate of the infection. Different integration site-specific features contribute to latency, such as the chromatin structure, including adjacent loci but also the provirus location in the nucleus (Lusic and Giacca, 2015; Lusic et al., 2013). Viral integration is a semi-random process (Bushman et al., 2005) in which HIV-1 preferentially integrates into active genes (Barr et al., 2006; Bushman et al., 2005; Demeulemeester et al., 2015; Ferris et al., 2010; Han et al., 2004; Lewinski et al., 2006; Mitchell et al., 2004; Schröder et al., 2002; Sowd et al., 2016; Wang et al., 2007). LEDGF, one of the main chromatin-tethering factors of HIV-1, binds to the viral integrase and to H3K36me3, and to a lesser extent to H3K4me1, thus directing the integration of HIV-1 into transcriptional units (Daugaard et al., 2012; Eidahl et al., 2013; Pradeepa et al., 2012). Also CPSF6, which binds to the viral capsid, markedly influences integration into transcriptionally active genes and regions of euchromatin (Sowd et al., 2016), explaining how HIV-1 maintains its integration in the euchromatin regions of the genome independently of LEDGF (Quercioli et al., 2016). Several studies have characterized the integration sites, however, these analyses have been restricted to productive infections. Using ENCODE reference datasets, our data are consistent with previous results, showing that HIV-1 preferentially targets actively transcribed regions (Marini et al., 2015; Wang et al., 2007; Chen et al., 2017). However, non-inducible latent proviruses are observed to be integrated to a higher extent into silenced chromatin. In addition, even though HIV integration is normally strongly disfavored in the heterochromatic condensed regions in LADs due to low chromatin accessibility, we show that some HIV integration does occur in LADs when using a previously published dataset of LADs (Guelen et al., 2008; Marini et al., 2015), and that latent proviruses that are not readily reactivatable are integrated at higher extent in LADs. Importantly, we identify a unique rare population among the latent cells that can be reactivated. In contrast to the non-inducible latent infections, the latency reversal of inducible latent proviruses might be explained by integration in an open chromatin context, similar to integration sites for productive proviruses, followed by subsequent heterochromatin formation and proviral silencing. As a consequence, the distinct integration sites between induced and non-induced latent proviruses highlight new possibilities for cure strategies. Indeed, the ‘shock and kill’ strategy aims to reactivate and eliminate every single replication-competent latent provirus, since a single remaining cell carrying a latent inducible provirus could, in theory, reseed the infection. However, our study and others point out several significant barriers to successful implementation of the ‘shock and kill’ strategy. First, LRAs only reactivate a limited fraction of latent proviruses. It is likely that some of the non-induced proviruses, such as those integrated into enhancers and transcriptionnal active regions of the genome, will reactivate after several rounds of activation, due to the stochastic nature of HIV activation (Dar et al., 2012; Ho et al., 2013; Singh et al., 2010; Weinberger et al., 2005). It is also likely that better suited LRAs combinations (two or more LRAs) will reactivate some of the non-induced proviruses integrated into silenced chromatin marked by H3K27me3 and H3K9me3. Indeed, several studies have shown that the pharmaceutical inhibition of H3K27me3 and H3K9me2/3 could sensitize latent proviruses to LRAs (Friedman et al., 2011; Nguyen et al., 2017; Tripathy et al., 2015). Second, Shan et al. have shown that latently reactivated cells are not cleared due to cytopathic effects or CTL response implying that immunomodulatory approaches, in addition of more potent LRAs, are likely required to achieve a cure for HIV infection (Shan et al., 2012). In conclusion, the heterogeneity of the latent reservoir calls for therapies addressing the different pools of latently infected cells. While ‘shock and kill’ might be helpful in reactivating and possibly eliminating a small subset of highly reactivatable latent HIV genomes, other approaches will be necessary to control or eliminate the less readily reactivatable population identified here and in patients. Perhaps, this latter population should rather be ‘blocked and locked’ using latency-promoting agents (LPAs), as described by several groups (Besnard et al., 2016; Kessing et al., 2017; Kim et al., 2016; Vranckx et al., 2016). For a functional cure, a stably silenced, non-reactivatable provirus is preferable to a lifetime of chronic active infection. Four HIV-1-infected individuals, who met the criteria of suppressive ART, undetectable plasma HIV-1 RNA levels (<50 copies/ml) for a minimum of six months, and with CD4+ T cell count of at least 350 cells/mm3, were enrolled. The participants were recruited from the SCOPE cohort at the University of California, San Francisco. Table 1 details the characteristics of the study participants. GCC-3’ and P4: 5’ rev-CTCCATGTTTTTCCAGGTCTCGAGCCTAGCTGTAGTGGGC CACGGC-3’. Finally, we amplified the 3’LTR sequence (Product 3) from RGH plasmid (Dahabieh et al., 2013) using primers P5: 5’ for-GCTCGAGACCTGGAAAAACATGGAG-3’ and P6: 5’ rev-GTGCCACCTGACGTCTAAGAAACC-3’, to add a fragment containing the AatII restriction site, in order to ligate the csGFP-EF1α-mKO2 cassette into pLAI (Peden et al., 1991). We then did sequential PCRs: products 1 and 2 were amplified using primers P1 and P4. PCR product (1 + 2) was mixed with product three and PCR amplified with P1 and P6 thus creating the full cassette. The cassette csGFP-EF1α-mKO2 was then digested with BamHI and AatII, and cloned into pLAI previously digested with the same enzymes to create HIVGKO. Of note, the Envelope open reading frame was disrupted by the introduction of a frame shift at position 7136 by digestion with KpnI, blunting, and re-ligation. To construct GKO-∆U3 3’LTR, we cloned a ∆U3 linker from pTY-EFeGFP (Chang et al., 1999; Cui et al., 1999; Iwakuma et al., 1999; Zolotukhin et al., 1996) into the KpnI/SacI sites of the 3’ LTR in HIVGKO. The production of HIVGKO and the assessment of HIV Latency Reversal Agents in Human Primary CD4+ T Cells are described in more detail at Bio-protocol (Battivelli and Verdin, 2018). Pseudotyped HIVDuoFluoI and HIVGKO viral stocks were generated by co-transfecting (standard calcium phosphate transfection method) HEK293T cells with a plasmid encoding HIVDuoFluoI or HIVGKO, and a plasmid encoding HIV-1 dual-tropic envelope (pSVIII-92HT593.1). Medium was changed 6–8 hr post-transfection, and supernatants were collected after 48 hr, centrifuged (20 min, 2000 rpm, RT), filtered through a 0.45 μM membrane to clear cell debris, and then concentrated by ultracentrifugation (22,000 g, 2 hr, 4°C). Concentrated virions were resuspended in complete media and stored at −80°C. Virus concentration was estimated by p24 titration using the FLAQ assay (Gesner et al., 2014). CD4+ T cells were extracted from peripheral blood mononuclear cells (PBMCs) from continuous-flow centrifugation leukophoresis product using density centrifugation on a Ficoll-Paque gradient (GE Healthcare Life Sciences, Chicago, IL). Resting CD4+ lymphocytes were enriched by negative depletion with an EasySepHuman CD4+ T Cell Isolation Kit (Stemcell Technologies, Canada). Cells were cultured in RPMI medium supplemented with 10% fetal bovine serum, penicillin/streptomycin and 5 µM saquinavir. Primary CD4+ T cells were purified from healthy donor blood (Blood Centers of the Pacific, San Francisco, CA, and Stanford Blood Center), by negative selection using the RosetteSep Human CD4+ T Cell Enrichment Cocktail (StemCell Technologies, Canada). Purified resting CD4+ T cells from HIV-1 or healthy individuals were cultured in RPMI 1640 medium supplemented with 10% FBS, L-glutamine (2 mM), penicillin (50 U/ml), streptomycin (50 mg/ml), and IL-2 (20 to 100 U/ml) (37°C, 5% CO2). Spin-infected primary CD4+ T cells were maintained in 50% of complete RPMI media supplemented with IL-2 (20–100 U/ml) and 50% of supernatant from H80 cultures (previously filtered to remove cells) without beads. Medium was replenished every 2 days until further experiment. HEK293T cells were obtained from ATCC (mycoplasma free). Feeder cells H80 was a kind gift from Jonathan Karn. H80 cells were cultured in RPMI 1640 medium supplemented with 10% fetal bovine serum (FBS), L-glutamine (2 mM), penicillin (50 U/ml), and streptomycin (50 mg/ml) (37°C, 5% CO2). HEK293T cells were cultured in DMEM medium supplemented with 10% FBS, 50 U/ml penicillin, and 50 mg/ml streptomycin. Purified CD4+ T cells isolated from healthy peripheral blood were stimulated with αCD3/CD28 activating beads (Thermofisher, Waltham, MA) at a concentration of 0.5 bead/cell in the presence of 20–100 U/ml IL-2 (PeproTech, Rocky Hill, NJ) for three days. All cells were spinoculated with either HIVDuoFluoI, HIVGKO or HIV Δ3U-GKO at a concentration of 300 ng of p24 per 1.106 cells for 2 hr at 2000 rpm at 32°C without activation beads. Infected cells were either analyzed by flow cytometry or sorted 4–5 days post-infection. CD4+ T cells were stimulated for 24 hr unless stipulated differently, with latency-reversing agents at the following concentrations for all single and combination treatments: 10 nM bryostatin-1, 1 μM JQ1, 30 nM panobinostat, αCD3/CD28 activating beads (1 bead/cell), or media alone plus 0.1% (v/v) DMSO. For all single and combination treatments, 30 μM Raltregravir (National AIDS Reagent Program) was added to media. Concentrations were chosen based on Laird et al. paper (Laird et al., 2015). Cells from Figure 4 were stained with α-CD69-PE-Cy7 (561928), α-CD25-APC (560987), and α-HLA-DR-PerCP-Cy5.5 (562007) (BD Bioscience, Franklin Lakes, NJ). Before collecting data using the FACS LSRII (BD Biosciences, Franklin Lakes, NJ) or the FACS AriaII (BD Biosciences, Franklin Lakes, NJ, Figures 3 and 4), cells were stained with violet Live/Dead Fixable Dead Cell Stain (Thermofisher, Waltham, MA) and fixed with 2% formaldehyde. Analyses were performed with FlowJo V10.1 software (TreeStar). Sorting of infected CD4+ T cells was performed with a FACS AriaII (BD Biosciences, Franklin Lakes, NJ) based on their GFP and mKO2 fluorescence markers at 4/5 days post-infection, and placed back in culture for further experimentation. In the experiments shown in Figures 2B and 4, we isolated both HIVGKO latently infected cells (GFP-, mKO2+, 3%) and uninfected cells (csGFP-, mKO2-, 97%) five days post-infection, before treating cells with LRAs. In the experiment shown in Figure 3, we isolated pure latent cells (GFP-, mKO2+) five days post-infection, before treating this pure population with LRAs. RNA and proteins (Figure 1B and C) were extracted with PARISTM kit (Ambion, Thermofisher, Waltham, MA) according to manufacturer’s protocol from same samples. RNA was retro-transcribed using random primers with the SuperScript II Reverse Transcriptase (Thermofisher, Waltham, MA) and qPCR was performed in the AB7900HT Fast Real-Time PCR System, using 2X HoTaq Real Time PCR kit (McLab, South San Francisco, CA) and the appropriate primer-probe combinations described in (Calvanese et al., 2013). Quantification for each qPCR reaction was assessed by the ddCt algorithm, relative to Taq Man assay GAPDH Hs99999905_m1. Protein content was determined using the Bradford assay (Bio-Rad, Hercules, CA) and 20 μg were separated by electrophoresis into 12% SDS-PAGE gels. Bands were detected by chemiluminescence (ECL Hyperfilm Amersham, GE Healthcare Life Sciences, Chicago, I) with anti-Vif, HIV-p24 and α-actin (Sigma, Saint-Louis, MO) primary antibodies. Total RNA (Figure 2A and B) wasextracted using the Allprep DNA/RNA/miRNA Universal Kit (Qiagen, Germany) with on-column DNAase treatment (Qiagen RNase-Free DNase Set, Germany). cDNA synthesis was performed using SuperScript IV Reverse Transcriptase with a combination of random hexamers and oligo-dT primers (ThermoFisher, Waltham, MA). Relative cellular HIV mRNA levels were quantified using a qPCR TaqMan assay using primers and probes described in (Bullen et al., 2014) on a QuantStudio 6 Flex Real-Time PCR System (Thermofisher, Waltham, MA). Relative cell-associated HIV mRNA copy numbers were determined in a reaction volume of 20 μL with 10 μL of 2x TaqMan Universal Master Mix II with UNG ( Thermofisher, Waltham, MA), 4 pmol of each primer, 4 pmol of probe, 0.5 μL reverse transcriptase, and 2.5 μL of cDNA. Cycling conditions were 50°C or 2 min, 95°C for 10 min, then 60 cycles of 95°C for 15 s and 60°C for 1 min. Real-time PCR was performed in triplicate reaction wells, and relative cell-associated HIV mRNA copy number was normalized to cell equivalents using human genomic GAPDH expression by qPCR and applying the comparative Ct method (Livak and Schmittgen, 2001). HIV integration site libraries and computational analysis were executed in collaboration with Lilian B. Cohn and Israel Tojal Da Silva as described in their published paper (Cohn et al., 2015), with a few small changes added to the computational analysis pipeline. First, we included integration sites with only a precise junction to the host genome. Second, to eliminate any possibility of PCR mispriming, we have excluded integration sites identified within 100 bp (50 bp upstream and 50 bp downstream) of a 9 bp motif identified in our LTR1 primer: TGCCTTGAG. Thirdly we have merged integration sites within 250 bp and have counted each integration site as a unique event. The list of integration sites for each donor and each population can be found as a source data file linked to this manuscript (Integration Sites Source data 1). Chromatin data (ChIP-seq) from CD4+ T cells was downloaded from ENCODE: H3K4me1 (ENCFF112QDR, ENCFF499NFE, ENCFF989BNS), H3K9me3 (ENCFF044NLN, ENCFF736KRZ, ENCFF844IWD, ENCFF929BPC), H3K27ac (ENCFF618IUD, ENCFF862SKP), H3K27me3 (ENCFF124QDD, ENCFF298JKA, ENCFF717ODY), H3K36me3 (ENCFF006VTQ, ENCFF169QYM, ENCFF284PKI, ENCFF504OUW), DNAse (GSM665812, GSM665839, GSM701489, GSM701491). Data were analyzed using Seqmonk (v0.33, http://www.bioinformatics.bbsrc.ac.uk/projects/ seqmonk/). We calculated expression (GSM669617) and chromatin mark abundance (the remaining ENCODE datasets) at the integration sites as bins of 500 bp centered on the integration site (read count quantification in Seqmonk: all non-duplicated reads regardless of strand, corrected per million reads total, non-log transformed). Gene annotations were not taken into account. Thresholds for expression values (upper 1/8th, upper quarter, half, and above 0) were set to distinguish five different categories, set as the upper 1/8th of expression values (high), upper quarter–1/8th (medium), upper half–quarter (low), lower half but above 0 (trace), 0 (silent). CD4+ T cells activation data in Figure 5A weredownloaded from GEO (GSE60235). Significance was analyzed by either paired t-test (GraphPad Prism) or proportion test (standard test for the difference between proportions), also known as a two-proportion z test (https://www.medcalc.org/calc/comparison_of_proportions.php), and specified in the manuscript. Journal of Leukocyte Biology 92:1147–1154. Cell Host & Microbe 20:785–797. Nature Structural & Molecular Biology 24:47–54. Annual Review of Medicine 66:407–421. Nature Structural & Molecular Biology 19:803–810. International Review of Cell and Molecular Biology 328:197–252. The Journal of Experimental Medicine 200:541–547. BioEssays : News and Reviews in Molecular, Cellular and Developmental Biology 37:1202–1214. Journal of Clinical Investigation 125:1901–1912. Cell Host & Microbe 13:665–677. Journal of Molecular Biology 427:688–694. Journal of Clinical Investigation 126:438–447. Cell Host & Microbe 21:494–506. Human Vaccines & Immunotherapeutics 9:790–799. Shocking HIV out of hiding: where are we with clinical trials of latency reversing agents? Current opinion in HIV and AIDS 11:394–401. Thank you for submitting your article "Chromatin Functional States Correlate with HIV Latency Reversal in Infected Primary CD4+ T Cells" for consideration by eLife. Your article has been reviewed by three peer reviewers, and the evaluation has been overseen by a Reviewing Editor and Prabhat Jha as the Senior Editor. The following individuals involved in review of your submission have agreed to reveal their identity: Marina Lusic (Reviewer #1); Vicente Planelles (Reviewer #2). In this elegant study, the authors report on the establishment of latency and reactivation of latent proviruses using a dual reporter HIV-1 virus (HIVGKO), which allows accurate separation and quantification of cells actively producing HIV from those harboring LTR silent, latent viruses. By using several latency-reversing agents (LRAs) the authors compare the efficacy of HIV-1 reactivation in cells from HIV-1 infected individuals and in cells infected in vitro with the HIVGKO. HDAC inhibitor panobinostat, BRD4 inhibitor JQ1, and the PKC inhibitor bryostatin-1 showed limited reactivation unless used in combination. The similar trends in reactivation potential with single or combination LRAs recapitulates well the existing literature. The observation that the synergistic effect of these drugs in reactivating HIV in patient samples was stronger than that observed in the cells infected in vitro is very interesting. The authors mapped a total of 1,803 integration sites mostly located in introns of actively transcribing genes. The transcription profiles of these genes as well as several histone marks using ENCODE data were also analyzed. Proviruses appear to be integrated in intragenic regions, with proviruses integrated more frequently in enhancer and actively transcribed regions of the genome compared to silenced regions. Non-inducible latently infected cells harbored virus integrated in enhancer and activated regions to a higher extent than in silenced regions, although reduced compared to productively infecting and reactivated proviruses. Non-inducible latently infected cells showed an increased level of integration into heterochromatin compared to productively and reactivated proviruses. The authors conclude that HIV-1 reversal from latency highly depends on the host transcriptional activity and chromatin context. Integration sites from PICs are outside of lamin-associated domains (LADs) whereas those from RLIC and NRLIC are found more often within LADs compared to latent cells. In conclusion, this well-written manuscript highlights the heterogeneous nature of the HIV-1 latent reservoir and the challenges it poses to strategies seeking to induce virus from latency as a method to eradicate HIV infection. Moreover, it underlines several important aspects regarding latent HIV, such as that viral RNA does not truly reflect the number of cells that are reactivated and that LRAs and T cell stimulation with CD3/CD28 results in reactivation of only a small portion of latent viruses. This powerful new dual color HIV reagent will be exciting to those in the field. A revised manuscript will be considered if the authors can address the major points outlined below within a reasonable amount of time. 1) Throughout the paper the definition of productively infected cells appears to change. For example, in Figure 1D the ratio of latent to productively infected cells, appears to be calculated by combining csGFP+mKO2- and csGFP+mKO2+ populations whereas in the text corresponding to Figure 1E and 1F the productively infected population is defined as csGFP+mKO2+ cells only. While the csGFP+mKO2- population is reduced in the HIVGKO model, this population is not negligible and should be consistently included when examining the productively infected population. 2) As the authors aim to establish a superior HIV latency model they should directly quantify the percent increase in latently infected cells compared to their previous DuoFluo reporter instead of only stating that they can identify a 'much larger' number of latent cells. 3) Throughout the paper the authors express surprise at the low level of reactivation of the latent reservoir observed while also stating that this observation is in agreement with the current literature giving a confusing impression of the novelty of their results. Please amend. 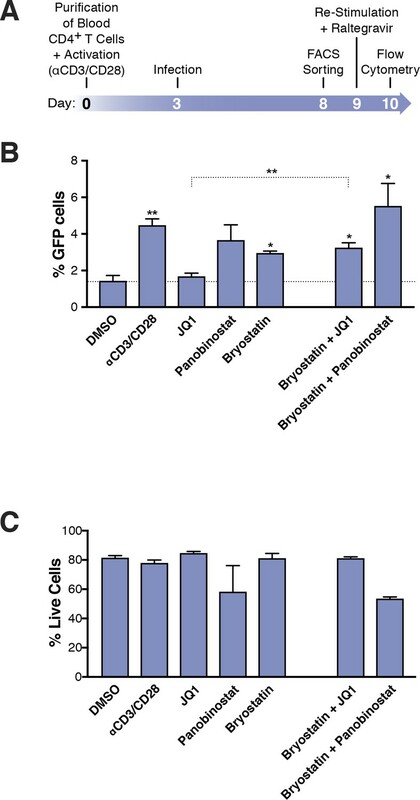 4) The fact that JQ1 and bryostatin induce reactivation in patient samples but only little effect on in vitro infected cells is a very interesting finding, pointing to differences in the sites of viral integration between patient cells and in vitro infected cells. It would be interesting if the authors could comment on these findings in the Discussion section. 5) The authors convincingly show that only a minor fraction of latently infected cells becomes GFP+ upon treatment with LRAs. Are there GFP- KO2-cells in the culture before and after treatment with LRAs (and if yes, which percentage?). It would be important to analyze the effect of sequential (e.g., 2) rounds of treatment with LRAs. Another important experiment, which the authors may consider to strengthen the conclusions, is to inhibit H3K27me3 and H3K9me3 followed by treatment with LRAs. Lastly, please clarify why the time of LRAs application is different for in vitro infected versus patient samples (such as 6 hours vs 24 hours). 6) The CD3/CD28 beads (positive control) only reactivated HIV in 3.1% of the latently infected cells. Can the authors comment on why they used 0.5 CD3/CD28 beads/cell for their infection as this is less than the 1 bead per cell recommended by the manufacturer. Did the authors try other positive controls such as PMA and Ionomycin as reported elsewhere (Laird et al., 2015)? Additionally, can the authors comment on why the latently infected cells were not incubated with the stimuli for longer than 24 hours? This might have resulted in a different outcome. 7) The authors compare the activation status of non-infected, reactivated and non-reactivated cells and conclude that "Overall, the comparison of the latent populations showed very little difference". Judging from the data, the conclusion appears too strong to me. There is a significantly lower percentage of CD25+CD69+ in non-reactivated cells which leaves open the possibility that, at least in part, this population has an incomplete/lower activation (which might partially account for lack of reactivation). The addition of a late marker of activation such as HLA-DR would also greatly strengthen the conclusions. An important control would be to repeat this experiment with another reactivating stimulation (e.g. PHA) and see if these differences persist. If so, the possibility that lack of full activation accounts for lower viral reactivation must be acknowledged and discussed. 8) The number of integration sites appears to be too low for RLIC (only 162). Please disclose how many genes are hit by these 162 IS. There is no tabular representation of the IS sequencing information. A file with all sorted IS is missing. Is the value for RLIC really 0% in Figure 5? A significantly higher expression (upon CD3-CD28 activation) of genes containing integration sites of non-reactivated HIV versus reactivated virus seems counterintuitive. As mentioned before the possibility that the lack of complete activation upon CD3-CD28 treatment characterizes the non-reactivated population must be further analyzed and discussed. 9) Clarification on which method was used for the quantification of gene expression is needed. The method presented is not as cited as it requires at least two housekeeping genes. (ddCT method is referenced in the Materials and methods section). 10) In the Discussion section the authors state that "productive proviruses predominantly target actively transcribed regions….On the other hand, non-inducible latent proviruses are observed to integrate into silenced chromatin…". The data in Figure 7A show that the majority of NRLIC viruses still integrate into enhancer and transcriptionally active regions of the genome although integrations in the NRLIC population occur to a higher extent in silenced regions of the genome compared to PIC and RLIC populations. This observation is not addressed in the discussion and the statement is, therefore, a bit misleading. We agree with the reviewer and have edited the text corresponding to Figure 1E and 1F according to the reviewers’ suggestion. The productively infected cells indeed comprise both csGFP+mKO2- and csGFP+mKO2+ populations. GFP+ mKO2- cells are now included in productively infected cells in all experiments. We have addressed this concern in the new version of the manuscript and added a supplemental figure (Figure 1—figure supplement 1A–C). The data shows that increasing the input of HIVGKO proportionately increased latently and productively infected cells (Figure 1—figure supplement 1A and 1B) with no change in the ratio of latent/productive infection (Figure 1—figure supplement 1C). This was not observed with our previous DuoFluo reporter (Figure 1—figure supplement 1A–C). The novelty of the results is our ability to quantify the fraction of latently infected cells that reactivate using our novel dual fluorescent virus. These results are in agreement with what has been observed in latently affected cells isolated from patients and reactivated in vitro. We have edited our manuscript to clarify this point. We are somewhat confused by this question since JQ1 and bryostatin respectively induce 1.7- and 6.8-fold increase of HIV mRNA in patients’ samples, and 1.1- and 6.2-fold increase in HIVGKO latently infected cells. These reactivation levels appear very similar. We are not sure what the reviewers want us to comment on. There were indeed csGFP-, mKO2- cells before and after LRA treatment in the case of Figure 2B (RT-qPCR quantification of HIV latency reactivation) (about 97% of csGFP-, mKO2-, and 3% of GFP-, mKO2+ after sort). In the experiment shown in Figure 3 (Flow cytometry of HIV latency reactivation), there were no csGFP-, mKO2- cells after the sort. We isolated pure latent cells (GFP-, mKO2+), and proceeded to LRA reactivation on this pure population. It would be important to analyze the effect of sequential (e.g., 2) rounds of treatment with LRAs. We agree with the reviewers since HIV latency reversal has been shown to be stochastic (discussed in the Discussion section). We have tried this experiment several times. Briefly, primary CD4 T cells were infected with HIVGKO, and latent cells were isolated by sorting at day 5 post-infection. We, then, isolated again the non-induced HIVGKO latently infected cells. However, these cells showed very low viability and we were unable to restimulate them and answer this question. Another important experiment, which the authors may consider to strengthen the conclusions, is to inhibit H3K27me3 and H3K9me3 followed by treatment with LRAs. We thank the reviewers for their suggestion. Several teams have already performed this experiment using different models, and they all reached the same conclusion: the inhibition of H3K27me3 sensitizes latent provirus to LRAs (Friedman et al., 2011; Nguyen et al., 2017; Tripathy et al., 2015). EZH2 is a key component of the Polycomb Repressive Complex 2 (PRC2) silencing machinery, and the enzyme is required for H3K27me3 deposition. In their study, Friedman et al. found that knocking down of EZH2 in latent Jurkat T-cells induced up to 40% of the latent HIV proviruses (Friedman et al., 2011). Knockdown of EZH2 also sensitized latent proviruses to external stimuli, such as T-cell receptor stimulation, and slowed the reversion of reactivated proviruses to latency. Similarly, cell populations that responded poorly to external stimuli carried HIV proviruses that were enriched in H3K27me3. Similarly, but with a different model, Tripathy et al. show that GSK343, a potent and selective EZH2/EZH1 inhibitor, reduced H3K27me3 of the HIV provirus in primary resting cells (Tripathy et al., 2015). This epigenetic change was not associated with increased proviral expression in latently infected resting cells. However, following the reduction in H3K27me3 at the HIV LTR, subsequent exposure to the HDACi vorinostat resulted in increases in HIV gag RNA and HIV p24 antigen production that were up to 2.5-fold greater than those induced by vorinostat alone. Finally, a recent study from Nguyen et al. found that the pharmaceutical inhibition of EZH2 in the Th17 primary cell model of HIV latency or resting memory T cells isolated from HIV-1-infected patients receiving highly active antiretroviral therapy, was sufficient to induce the reactivation of latent proviruses (Nguyen et al., 2017). The methyltransferase inhibitors showed synergy with interleukin-15 and VOR. EHMT2 and SUV39H1 are respectively components of the H3K9me2 and H3K9me3 silencing machinery. In their study, Friedman et al. show that SUV39H1 can contribute to HIV-1 latency in Jurkat T cells, but it appears to be less effective than EZH2 (Friedman et al., 2011). Nguyen et al. found that the inhibition of H3K9me2 in the Th17 primary cell model of HIV latency or resting memory T cells isolated from HIV-1-infected patients receiving highly active antiretroviral therapy, was sufficient to induce the reactivation of latent proviruses (Nguyen et al., 2017). In conclusion, data showing that inhibiting H3K27me3 and H3K27me2/3 sensitizes latent provirus to downstream LRAs treatment is available and supports our model. We have added text in our Discussion section describing these studies. Lastly, please clarify why the time of LRAs application is different for in vitro infected versus patient samples (such as 6 hours vs 24 hours). 1) Experiments with patients’ samples and in vitro latently infected cells are different. In the case of in vitro experiment, we are sorting cells after infection, while we are not sorting cells in the case of patients’ samples. 2) In preliminary experiments, we noticed that sorted cells showed a spontaneous reactivation of latent HIV which became more prominent after 24 hours and was minimum at 6 hours (Author response image 1). We therefore focused on analyzing the cells 6 hours after sorting and addition of LRA to eliminate this confounding variable. Time-course plot of percent of GFP+ cells (bars) and live cells (lines) after sort of latently infected CD4+ T-cells (n = 2, mean + SEM). In our preliminary experiments, we did not observe any difference between 0.5 bead/cell and 1 bead/cell when infecting cells (data not shown). Given the high price of these beads, we decided to use 0.5 bead/cell to activate cells before infection. However, when we reactivated latently infected cells, we used 1 bead/cell (specified in the Materials and methods section). Did the authors try other positive controls such as PMA and Ionomycin as reported elsewhere (Laird et al., 2015)? 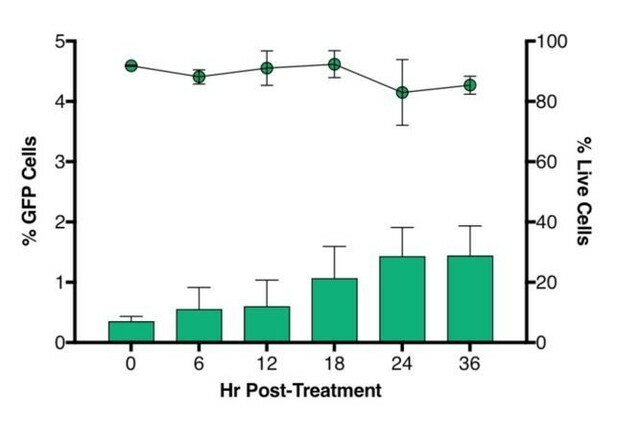 In preliminary experiment, we indeed used PMA+Ionomycin, but saw similar reactivation as aCD3/CD28 in patients’ samples and HIVGKO latently infected cells after 24 hours of treatment (Author response image 2). (1)Intracellular HIV-1 mRNA levels in rCD4s, obtained from infected individuals and treated ex vivo with a single LRA or a combination of two LRAs for 24 hours, presented as fold induction relative to DMSO control. (n = 4, mean + SEM). (2) Intracellular HIV-1 mRNA levels in HIVGKO latently infected CD4+ T-cells, and treated with a single LRA or a combination of two LRAs for 24 hours in presence of raltegravir, presented as fold induction relative to DMSO control. (n = 3 (different donors), mean + SEM, paired t-test). Additionally, can the authors comment on why the latently infected cells were not incubated with the stimuli for longer than 24 hours? This might have resulted in a different outcome. We did not treat latent cells with stimuli for longer than 24 hours since most of the literature is using 24 hours. However, we looked at latency reversal at 24, 36 and 48 hours post-treatment, and did not see much differences. We actually did observe some decrease of latency reversal after 48 hours of treatment with panobinostat, likely due to drug toxicity (Author response image 3). Percentage of GFP+ cells are shown after stimulation of latently infected CD4+ T-cells with LRAs for 24-, 36- or 48 hours (n = 2 (different donors), mean + SEM, paired t-test). 7) The authors compare the activation status of non-infected, reactivated and non-reactivated cells and conclude that "Overall, the comparison of the latent populations showed very little difference". Judging from the data, the conclusion appears too strong to me. There is a significantly lower percentage of CD25+CD69+ in non-reactivated cells which leaves open the possibility that, at least in part, this population has an incomplete/lower activation (which might partially account for lack of reactivation). The addition of a late marker of activation such as HLA DR would also greatly strengthen the conclusions. We agree with the reviewers’ comment and repeated the experiment with HLA-DR as a marker along with CD69 and CD25 (Figure 4 of the revised manuscript). However, the data with these 4 donors do not show significant lower percentage of CD25+/CD69+. Furthermore, the data still show that the majority of the phenotype for both RLIC and NRLIC are highly activated cells (around 70% of cells expressing both early and intermediate activation markers CD69 and CD25 respectively). No difference is observed when looking at HLA-DR.
We conclude that there is no reproducible difference in activation markers between reactivated vs. unreactivated cells. These new data are shown in the revised manuscript (Figure 4). In addition of looking at the RLIC and NLRIC populations activation status after aCD3/CD28, we also looked at these populations’ phenotype after PHA treatment (Author response image 4(2)) as suggested by the reviewers, and at populations with no stimuli (DMSO – Author response image 4(1)). Interestingly, PHA treated cells have a very similar profile to untreated (DMSO) cells at 24 hours post treatment, and it seems that PHA is not as effective as aCD3/CD28 in activating cells, at least 24 hours post-treatment. T-cell activation patterns between double negative, reactivated (RLIC) and non-reactivated (NRLIC) latently infected cells. Briefly, CD4+ T-cells were purified from blood of four healthy donors and activated for 72 hours with αCD3/CD28 beads and 20 U/ml IL-2 before infection with HIVGKO. At 4 days post-infection, csGFP- were sorted, cultured overnight and stimulated with DMSO (1) or PHA (2). At 24 hours post-treatment, cells were stained for CD25, CD69, and HLA-DR activation markers before performing FACS analysis. (n=4, mean + SEM, paired t-test; *p<0.05; **p<0.01). 8) The number of integration sites appears to be too low for RLIC (only 162). Please disclose how many genes are hit by these 162 IS. There is indeed a small number of RLIC, since we do have a very small population to work with. As shown in Figure 6A of the manuscript, 80.9% of RLIC IS are within genes (= 131 IS are within genes). There is no tabular representation of the IS sequencing information. A file with all sorted IS is missing. We provided an excel file Source data 1 with all IS for each donor and each population. This file comprises 4 tabs. The first tab is the complete list of integration sites for all populations (PIC, RLIC, NRLIC), and the 3 donors. The second tab is the complete list of integration sites for PIC population from the 3 donors, the third tab is the complete list of integration sites for RLIC population from the 3 donors, and the last tab is the complete list of integration sites for NRLIC population from the 3 donors. Each excel tab has 20 columns (Donor, Status, Chromosome, Start, End, Size, Strand, Expression over integration site (same strand), expression over integration site (opposite strand), gene symbol, Ensemble accession number, Description gene, Start gene, End gene, Distance to closest gene, Gene strand, Expression gene, Integration UTR/intron, Direction integration and gene). Is the value for RLIC really 0% in Figure 5? Yes, the value is truly 0% in Figure 5. A significantly higher expression (upon CD3-CD28 activation) of genes containing integration sites of non-reactivated HIV versus reactivated virus seems counterintuitive. As mentioned before the possibility that the lack of complete activation upon CD3-CD28 treatment characterizes the non-reactivated population must be further analyzed and discussed. We agree with the reviewers and were surprised as well not to observe a correlation between αCD3/CD28-induced latent proviruses integration sites and genes responsive to T-cell activation signals. However, that is what our analysis reveals, and the good activation phenotype of αCD3/CD28 treated cells cannot explain the lack of correlation. We edited the text and provide a more detail protocol in the Materials and methods section regarding the normalization of gene expression. Since we didn’t have the standard used in Bullen et al., 2014, we measured relative (instead of absolute HIV mRNA) copy number. We believe that this normalization is appropriate since we are reporting fold changes relative to DMSO. We used the same primers and probe as Bullen et al., 2014, but used a modified qPCR protocol that measures relative copy number (and used GAPDH to normalize the data). We changed the reference for the ddCT method. We have edited the text to address this point (Discussion section). © 2018, Battivelli et al. An improved dual-color reporter reveals how the fate of latent HIV-1 depends on where it integrates in the human genome.